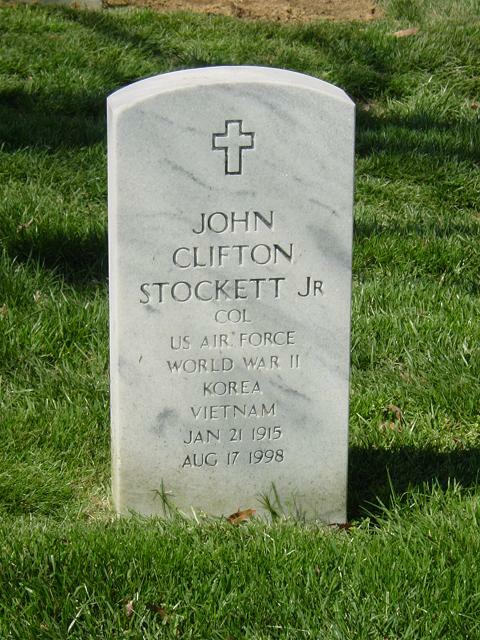 John Clifton Stockett Jr., 83, a retired Air Force colonel and aerospace marketing executive, died August 17, 1998 at the Fairfax retirement facility at Fort Belvoir, Virginia. He had a heart ailment. Colonel Stockett was a native of Nashville who attended the Air Command and Staff College and Armed Forces Staff College. He began his military service in 1942 and trained bombardiers during World War II. He was posted to Germany after the war. He served during the Korean War and the Vietnam War. He was deputy chief of staff for military assistance programs in the mid-1960s of the Pacific Air Force. Colonel Stockett retired in 1968 as director of policy in the office of foreign military sales. After he retired, he worked for Fairchild Corp. and Sanders Associates. His honors included a Distinguished Service Medal, Silver Star, three Legions of Merit, a Distinguished Flying Cross and three Bronze Stars. He was a member of the Retired Officers Association, Veterans of Foreign Wars, National Aviation Club, American Legion, Air Force Association and Association of Old Crows. His wife of 54 years, Betty Carter Moss, died in 1992. Survivors include a daughter, Marcia Stockett-Howlett of Virginia Beach; a brother; and four grandchildren. On Monday, August 17, 1998, at Ft. Belvoir, VA, husband of the late Betty Moss Stockett; father of Marcia Stockett-Howlett and the late Susan T. Brown; brother of Lawrence E. Stockett and the late Mildred S. Victor; grandfather of Jon-Kenneth Thomas, Bethany C., Andrea H. and Susan C. Howlett. Funeral services will be held on Thursday, August 27 at 9 a.m. at the Ft. Myer Old Post Chapel. Interment Arlington National Cemetery with full military honors. If desired, donations may be made to the American Heart Association.